For 42 days, Baghdad and other cities and towns were bombarded with nearly 140,000 tons of explosives, by international estimates. 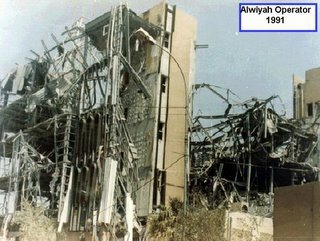 The bombing was relentless- schools, housing complexes, factories, bridges, electric power stations, ministries, sewage facilities, oil refineries, operators, and even bomb shelters (including the only baby formula factory in Iraq and the infamous Amirya Shelter bombing where almost 400 civilians were killed). What happened in the south in 1991 is similar to what happened in Baghdad in 2003- burning, looting and attacks. The area fell into chaos after the Republican Guard was pulled out to different governorates for the duration of the war. Meanwhile, the US was bombing the Iraqi army as it was pulling out of Kuwait and the Tawabin were killing off some of the Iraqi troops who had abandoned their tanks and artillery and were coming back on foot through the south. Many of those troops, and the civilians killed during the attacks, looting, and burning, were buried in some of the mass graves we conveniently blame solely on Saddam and the Republican Guard- but no one bothers to mention this anymore because it’s easier to blame the dictator. But I digress- the topic today is reconstruction. Immediately after the war, various ministries were brought together to do the reconstruction work. 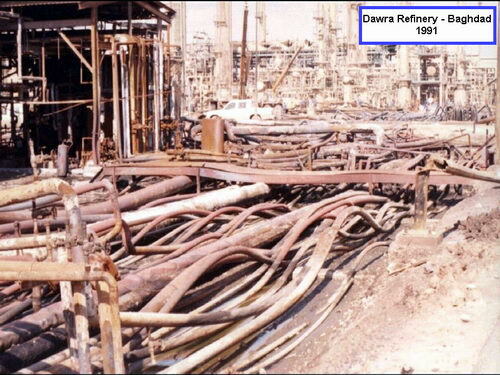 The focus was on the infrastructure- to bring back the refineries, electricity, water, bridges, and telecommunications. The task was a daunting one because so many of Iraq’s major infrastructure projects and buildings had been designed and built by foreign contractors from all over the world including French, German, Chinese and Japanese companies. 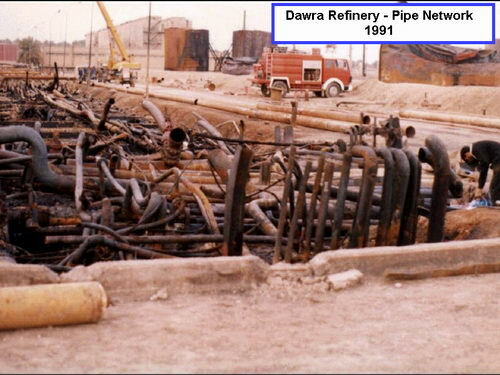 The foreign expertise was unavailable after 1991 due to the war and embargo and Iraqi engineers and technicians found themselves facing the devastation of the Gulf War all alone with limited supplies. 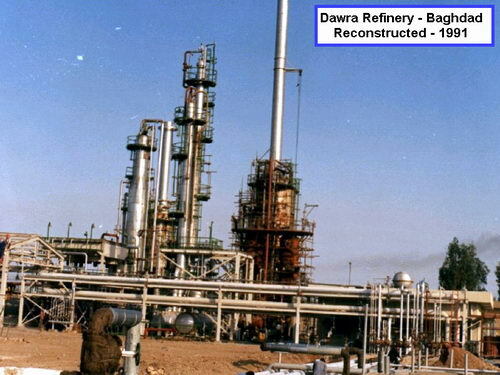 Two years and approximately 8 billion Iraqi dinars later, nearly 90% of the damage had been repaired. It took an estimated 6,000 engineers (all Iraqi), 42,000 technicians, and 12,000 administrators, but bridges were soon up again, telephones were more or less functioning in most areas, refineries were working, water was running and electricity wasn’t back 100%, but it was certainly better than it is today. 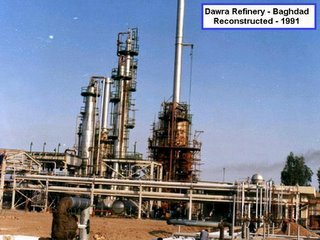 Within the first two years over 100 small and large bridges had been reconstructed, 16 refineries, over 50 factories and industrial compounds, etc. 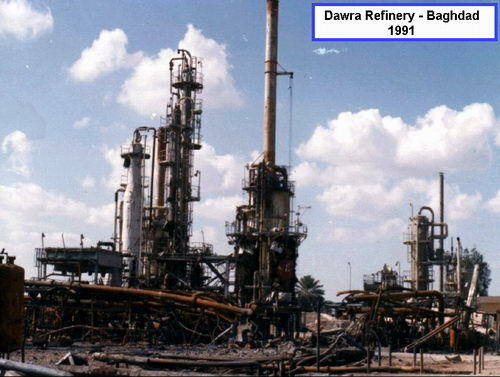 It wasn’t perfect- it wasn’t Halliburton… It wasn’t KBR…but it was Iraqi. 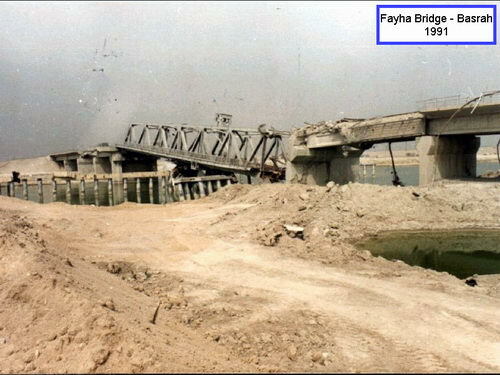 There was that sense of satisfaction and pride looking upon a building or bridge that was damaged during the war and seeing it up and running and looking better than it did before. Now, nearly three years after this war, the buildings are still piles of debris. Electricity is terrible. Water is cut off for days at a time. Telephone lines come and go. Oil production isn’t even at pre-war levels… and Iraqis hear about the billions upon billions that come and go. A billion here for security… Five hundred million there for the infrastructure… Millions for voting… Iraq falling into deeper debt… Engineers without jobs simply because they are not a part of this political party or that religious group… And the country still in shambles. One of the biggest, most complicated and most swiftly executed reconstruction projects was the Dawra Refinery in Baghdad. 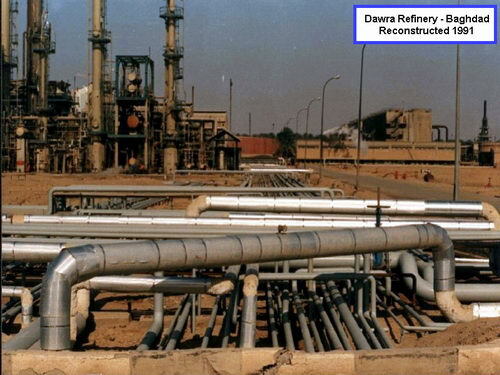 It is Iraq’s oldest refinery and one of its largest. It was bombed several times during the Gulf War and oil production came to a halt. 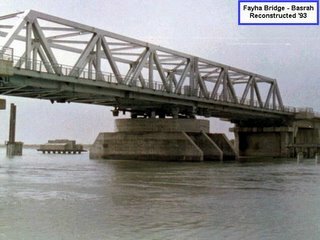 After the war, it is said that the Iraqi government negotiated with an Italian company to reconstruct it but the price requested by the company was extremely high. It was decided then that the reconstruction effort would be completely local and the work began almost immediately. 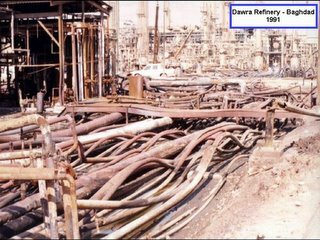 Several months later, during the summer of 1991, when the Italian experts came back to assess the damage, they found that the refinery was functioning. Below are some pictures that were sent to me by an engineer who was a part of the reconstruction effort and is currently jobless in Amman. The pictures are both painful and inspiring. 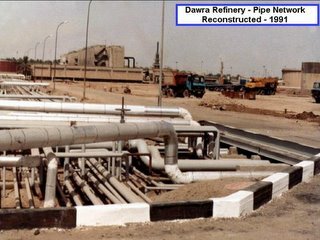 Fifteen years later and it is difficult to see the damage that was wrought on the country… But the ‘after’ pictures give me faith that Iraq will rise once more- in spite of occupiers and meddlers. Note: I was tempted to stamp all the ‘after’ pictures with “AMERICANS DID NOT RECONSTRUCT THIS” as I know that in a month some clueless Republican will send them back to me with the words, “Look at how we reconstructed your country!”. Special thanks to M. Hamed for the pictures and the info about the reconstruction effort. I read the news as a subtitle on tv. We haven't had an internet connection for several days so I couldn't really read about the details. All I knew was that a journalist had been abducted and that her Iraqi interpreter had been killed. He was shot in cold blood in Al Adil district earlier this month, when they took Jill Carroll... Theysay he didn't die immediately. It is said he lived long enough to talk to police and then he died. I found out very recently that the interpreter killed was a good friend- Alan, of Alan's Melody, and I've spent the last two days crying. Everyone knew him as simply 'Alan', or "Elin" as it is pronounced in Iraqi Arabic. Prior to the war, he owned a music shop in the best area in Baghdad, A'arasat. He sold some Arabic music and instrumental music, but he had his regular customers - those westernized Iraqis who craved foreign music. For those of us who listened to rock, adult alternative, jazz, etc. he had very few rivals. He sold bootleg CDs, tapes and DVDs. His shop wasn't just a music shop- it was a haven. Some of my happiest moments were while I was walking out of that shop carrying CDs and tapes, full of anticipation for the escape the music provided. He had just about everything from Abba to Marilyn Manson. He could provide anything. All you had to do was go to him with the words,"Alan- I heard a great song on the radio... you have to find it!" Andhe'd sit there, patiently, asking who sang it? You don't know? Ok- was it a man or a woman? Fine. Do you remember any of the words? Chances were that he'd already heard it and even knew some of the lyrics. 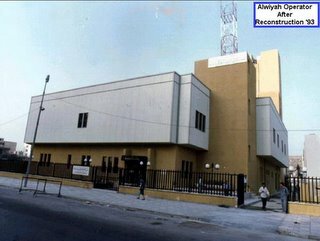 During the sanctions, Iraq was virtually cut off from the outside world.We had maybe four or five local tv stations and it was only during the later years that the internet became more popular. Alan was one of those links with the outside world. Walking into Alan's shop was like walking into a sort of transitional other world. Whenever you walked into the store, great music would be blaring from his speakers and he and Mohammed, the guy who worked in his shop, would be arguing over who was better, Joe Satriani or Steve Vai. He would have the latest Billboard hits posted on a sheet of paper near the door and he'd have compiled a few of his own favorites on a 'collection' CD. He also went out of his way to get recordings of the latest award shows- Grammys, AMAs, Oscars, etc. You could visit him twice and know that by the third time, he'd have memorized your favorites and found music you might be interested in. He was an electrical engineer- but his passion was music. His dream was to be a music producer. He was always full of scorn for the usual boy bands - N'Sync, Backstreet Boys, etc. - but he was always trying to promote an Iraqi boy band he claimed he'd discovered,"Unknown to No One". "They're great- wallah they have potential." He'd say. E. would answer, "Alan, they're terrible." And Alan, with his usual Iraqi pride would lecture about how they were great, simply because they were Iraqi. You could walk into the shop and find no one behind the counter- everyone was in the other room, playing one version or another of FIFA soccer on the Play Station. He collected those old records, or 'vinyls'. The older they were, the better. While he promoted new musical technology, he always said that nothing could beat the soundof a vintage vinyl. We went to Alan not just to buy music. It always turned into a social visit. He'd make you sit down, listen to his latest favorite CD and drink something. Then he'd tell you the latest gossip- he knew it all. He knew where all the parties were, who the best DJs were and who was getting married or divorced. He knew the local gossip and the international gossip, but it was never malicious with Alan. It was always the funny sort. The most important thing about Alan was that he never let you down. Never. Whatever it was that you wanted, he'd try his hardest to get it. If you became his friend, that didn't just include music- he was ready to lend a helping hand to those in need, whether it was just to give advice, or listen after a complicated, difficult week. After the war, the area he had his shop in deteriorated. There were car bombs and shootings and the Badir people took over some of the houses there. People went to A'arasat less and less because it was too dangerous. His shop was closed up more than it was open. He shut it up permanently after getting death threats and a hand grenade through his shop window. His car was carjacked at some point and he was shot at so he started driving around in his fathers beaten-up old Toyota Cressida with a picture of Sistani on his back window, "To ward off the fanatics..." He winked and grinned. E. and I would stop by his shop sometimes after the war, before he shut it down. We went in once and found that there was no electricity,and no generator. The shop was dimly lit with some sort of fuel lampand Alan was sitting behind the counter, sorting through CDs. He was ecstatic to see us. There was no way we could listen to music so he and E. sang through some of their favorite songs, stumbling upon the lyrics and making things up along the way. Then we started listening to various ring tones and swapping the latest jokes of the day. Before we knew it, two hours had slipped by and the world outside was forgotten, an occasional explosion bringing us back to reality. It hit me then that it wasn't the music that made Alan's shop a haven- somewhere to forget problems and worries- it was Alan himself. Here we are in the first days of 2006. What does the ‘6’ symbolize? How about- 6 hours of no electricity for every one hour of electricity? Or… 6 hours of waiting in line for gasoline that is three times as expensive as it was in 2005? Or an average of six explosions per day near our area alone? A few days ago, the cousin took me to buy a pack of recordable CDs. The price had gone up a whole dollar, which may seem a pittance to the average American or European, but it must be remembered that many Iraqis make as little as $100 a month and complete families are expected to survive on that. People buy black market gasoline because for many, waiting in line five, six, seven… ten hours isn’t an option. We’ve worked out a sort of agreement amongst 4 or 5 houses in the neighborhood. According to a schedule (which is somewhat complicated and involves license plate numbers, number of children per family, etc. ), one of us spends the day filling up the car and then the gasoline is distributed between the four or five involved neighbors. I know for most of the world, highly priced gasoline is a common concern. For Iraqis, it represents how the situation is deteriorating. Gasoline and kerosene were literally cheaper than bottled water prior to the war. It’s incredibly frustrating that while the price of petrol is at a high, one of the worlds leading oil-producing countries isn’t producing enough to cover its own needs. I guess the Iraqis who thought the US was going to turn Iraq into another America weren’t really far from the mark- we too now enjoy inane leaders, shady elections, a shaky economy, large-scale unemployment and soaring gas prices. Goodbye 2005- the year of SCIRI, fraudulent elections, secret torture chambers, car bombs, white phosphorous, assassinations, sectarianism and fundamentalism… you will not be missed. Let us see what 2006 has in store for us.